"Knights had no meaning in this game. It wasn't a game for knights." While I'm patiently waiting for my next installment of crime novels from the UK, I decided to peruse my shelves for something I haven't read yet and came up with this book. 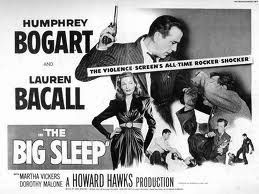 The Big Sleep is Chandler's first Philip Marlowe novel and if the first book of this series is any indicator, I'm going to have a lovely time over the next few weeks with the rest. As I often say, just because a book was written decades earlier doesn't mean it's not still good. Marlowe is a $25 dollar-a-day plus-expenses private eye living and working in the Los Angeles area. He once worked for the DA as an investigator, but according to Marlowe, they fired him for insubordination, something on which he tests "very high." He's been to college, lives in a small apartment, furnished with very little except "a few books, pictures, radio, chessmen, old letters, stuff like that," things that "took the place of a family." He keeps rye in his coat pocket along with his gun and has a decent enough relationship with the DA's office even though he no longer works there. the poster for the 1946 movie starring Humphrey Bogart and Lauren Bacall. The Big Sleep begins as Marlowe arrives at the Sternwood home, summoned there by the family patriarch, the General. They meet in the Sternwood's steamy greenhouse, where the old man, confined to a wheelchair, reveals the reason for Marlowe's visit. It seems that Sternwood's younger daughter Carmen has racked up some debts and now they're being called in. It's blackmail, but the General doesn't want to go to the police. He wants Marlowe to take care of things. While they're talking, the General brings up the disappearance of his son-in-law Rusty Regan, former bootlegger and formerly of the IRA, once married to older daughter Vivian, and now missing. He doesn't ask Marlowe to find Regan, but as it turns out, Regan is never far from anyone's mind in this novel. The trail to the blackmailer begins at a store owned by Arthur Geiger, Rare Books and De Luxe Editions, where it doesn't take long for Marlowe to figure out exactly what sort of books Geiger has to offer. Parked outside the Geiger home later that night, Marlowe hears shots and then the sound of someone running, so he breaks in and discovers Geiger dead on the floor and a drug-addled Carmen Sternwood buck naked after having had photos taken of her. Add to this scenario a car that had done an end run over the Lido Pier and pulled out of the water by police the next day, and we're off on a true, hardboiled adventure that doesn't let up until the last page. "The General spoke again, slowly, using his strength as carefully as an out-of-work show-girl uses her last good pair of stockings." "Over the entrance doors, which would have let in a troop of Indian elephants, there was a broad stained-glass panel showing a knight in dark armor rescuing a lady who was tied to a tree an didn't have any clothes on but some very long and convenient hair. The knight had pushed the vizor of his helmet back to be sociable, and he was fiddling with the knots on the ropes that tied the lady to the tree and not getting anywhere. I stood there and thought that if I lived in the house, I would sooner or later have to climb up there and help him. He didn't seem to be really trying." He's very much into protecting his clients and doesn't give in to the whole money/corruption scene like a lot of the cops who offer protection for a cost. He's a bit of an idealist who can't be bought. When he's not always totally honest with the police, it's all about protecting his client. However, it's like sometimes he understands there are some women who don't want to be rescued no matter how hard he tries, and that no matter what, he realizes that the only way he can keep certain things from the General is to become a "part of the nastiness" he's fallen into. 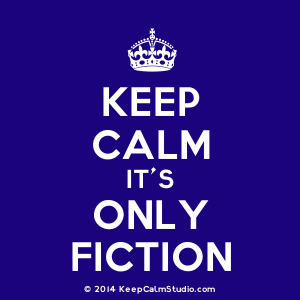 The Big Sleep, if you haven't read it, may seem a bit old-fashioned and misogynist -- lots of bad treatment of women, plenty of homophobia etc., but remember that this was written at a different time when those things were pretty much the status quo. If you can get past the negatives, the novel is superb -- one of those books where when it's over, you can't wait to pick up the next in the series. It's the character of Marlowe that makes this book so good, and then, of course, there's Chandler's incredible writing talent that created him and brought the streets, foothills and people of Los Angeles so vividly to life like a photograph of the past. I'm going straight onto the next one from here -- that's how much I loved this book. Definitely recommended, although it's probably not for every crime fiction reader. Now I'm going to go put my DVD starring Bogart and Bacall in my blu-ray player, make some popcorn and push play. I love this film and all of the other three movies with Bogart and Bacall -- To Have and Have Not, Dark Passage and Key Largo. I haven't read this book, but the movie doesn't clear up whodunnit, and I've read that the readers of the book have a hard time with this, too. I will try to read it at some point. It intrigues me. And I must rewatch all four movies again soon. It's so well written, though! There's a book I want to get that goes through all of the places in all of the novels -- it would definitely be helpful.